As a young ham radio enthusiast, I assembled my first operating station by tearing down and reassembling broken TVs and radios. After months of saving from several odd jobs, I was able to step up to a 'real' rig — a DIY crystal-controlled CW transmitter from the now defunct Heathkit Corporation. Over the years, I eventually acquired an amplifier, digital multimeter, SWR meter, PLL-based transceiver, and other test and operating equipment kits from the company. The equivalent of paint-by-numbers, the various kits were not only affordable, but easy to repair and modify. Given the well-written documentation and large user community, I was virtually guaranteed of success, and there was no scrounging for hard-to-find, expensive parts. Heathkit eventually lost the niche for low-end communications and test equipment to less expensive, more compact, and more functional fully-assembled equipment from overseas. Today, it's still the case that pre-assembled, imported equipment is often the most affordable option. However, for electronics enthusiasts, it's not only the final product, but the process of designing and/or building circuits that counts. Economics still matter, but most of us are willing to pay a reasonable premium for the opportunity to assemble a circuit ourselves. In fact, what makes a kit so attractive these days is the relative cost savings over assembling a circuit piecemeal; $5 for a blank perf-board; $2 for a battery clip; $1.50 for a voltage regulator chip. Pretty soon, the cost of even the most modest circuit can get out of hand. Hence, the renewed popularity of kits. 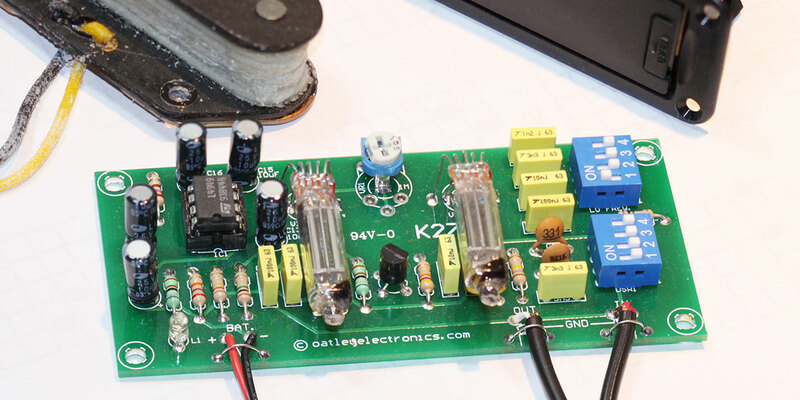 My latest kit project is a hybrid preamp, the K-270 from Oatley Electronics (www.oatleyelectronics.com). At $20, the kit (see photo above) makes an affordable, high-quality guitar amplifier that provides real 'tube sound' that even the best all solid-state preamps can only approximate. As points of comparison, I could have bought a self-contained, solid-state preamp with a nice enclosure for about $35, or copied the K-270's circuit design and ordered the parts from Mouser for about $50. I went with the kit, and used a guitar body for the main enclosure. Go ahead and make your own comparison — the parts list and schematic are available on the Oatley Electronics website. As you can see in the photo, the hybrid preamp features two JAN6418 sub-miniature pentodes. The pentodes are cascaded in common cathode configuration, each with 1.2V @ 5 mA filaments, followed by a MOSFET buffer. A 5V regular accepts 9 VDC battery input. In addition, an input high-pass and low-pass filter composed of switched capacitors enables you to modify the basic 20 Hz - 30 kHz response. Maximum gain is about 100, with a maximum draw of about 11 mA at 9V. The diminutive preamp is just a little larger than a magnetic guitar pickup. Instead of designing an amplifier from scratch, I invested my time in integrating the amplifier into my electric guitar. After routing my solid-body traveler guitar body with two cavities — one for the amplifier and one for the 9V battery holder — I coated each cavity with conductive paint. Next, I mounted the board and battery holder, and added an on-off switch in series with the 9V supply. As with most well-designed and documented kits, the preamp lends itself to modification. I couldn't resist modifying the input high- and low-pass filter circuits and adjusting the tube plate voltage to get more of a vintage sound from the preamp.